February 9, 2015 By Elizabeth Lindemann 5 Comments / This post may contain affiliate links. Zach and I aren’t really a mushy-gushy Valentine’s day couple. Want to know what we usually do to celebrate? Get fried chicken, sit on our couch, and watch a movie. It’s amazing and I wouldn’t have it any other way. It’s extremely romantic and don’t you dare tell me otherwise. 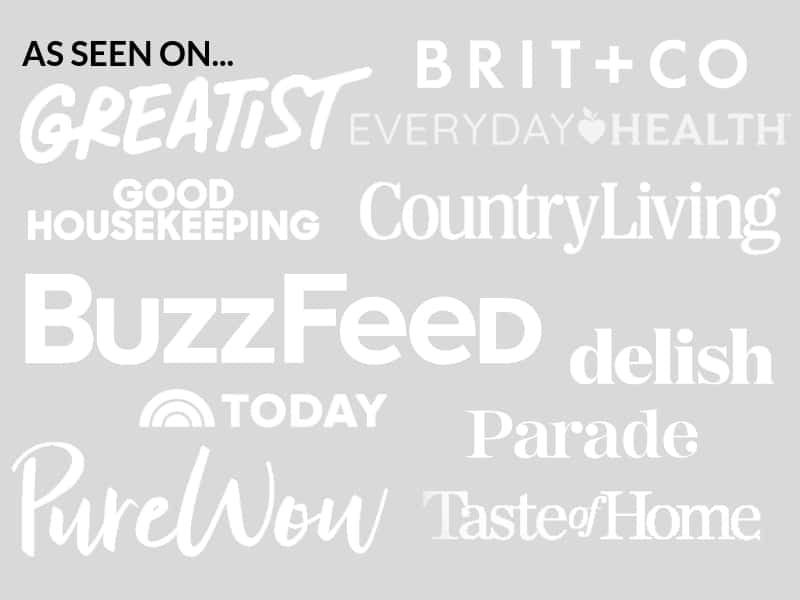 But as a blossoming food blogger, I have decided that I need to embrace Valentine’s day by creating something yummy, adorable, and heart-shaped. And red. Otherwise, I’ll totally feel left out of the pinterest dessert trends of the month! Plus, we are on our 27th 3rd snowstorm in the last two weeks. Cooped up snow days = baking. Lots and lots of baking. Strawberry and ginger. SO DELICIOUS! I had strawberries, and I had fresh ginger, and I thought, why not put them together? The thing I love about these is that despite the fact that they are a dessert, they use very little sugar. The filling has a tart, warm, sweet-but-not-too-sweet taste created from the natural flavors of the strawberries and ginger. It’s very similar to strawberry rhubarb. And the crust, like any good flaky pie crust, has a buttery flavor with just a hint of sweetness. I used this traditional pie crust recipe, but you can adapt these pies to any dietary restriction you follow by changing up the pie crust to a whole wheat, vegan, or gluten free version. 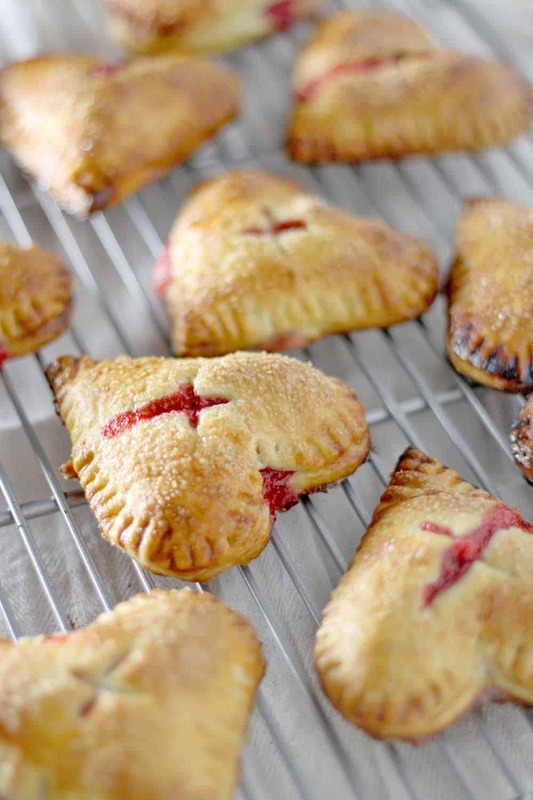 Once you have the crust ready, these mini hand pies are very easy to assemble. You will need one special supply: a heart shaped cookie cutter (unless you are very good at freehand cutting hearts). I used one that is 3″ wide. Of course, you can use a round or other shaped cutter that you have on hand- just make sure it’s fairly large. Or, just cut rectangles! Roll out the pie crust (I used a double recipe- so, two standard pie crusts) on a floured surface and cut the shapes out. Mix together some chopped strawberries (make sure you chop them, not slice or quarter. Otherwise, the pieces will be too big for this mini pie version) with a little sugar, cornstarch, and freshly minced ginger (you can use a microplane zester for this task). You’ll also need a simple egg wash (one egg, beaten, mixed with about a tablespoon of water). For a vegan alternative, use non-dairy milk, such as soy or almond. On one cut-out, place about 2 tablespoons of the filling (don’t use too much!) in the center. Brush the edges around the filling with the egg wash with a pastry brush, place another cut-out on top, and use a fork to seal the edges (the egg wash will allow it to seal and stick better, to prevent the filling from leaking out the edges while baking). Use a very sharp paring knife to cut a criss cross in the top of the pie- this is crucial for the steam to vent out from the inside of the pie while baking. Put the finished pies on a parchment covered baking sheet. Brush the tops with the egg wash, and sprinkle with turbinado sugar. Bake at 425 degrees for 20 minutes, or until golden browned. I will absolutely be making these again- whether it’s for next Valentine’s day or if I find myself with a surplus of strawberries at some other time during the year. 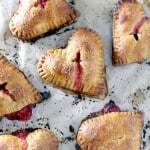 (Although, I will probably use the traditional half-moon shaped hand pies, or other shapes, at other times during the year.) They stay fresh at room temperature for 4 days in an airtight container, or you can freeze them for a tasty treat whenever you want one. And since I am eating one right at this very moment for breakfast whilst writing this post, I am thinking that this is a much healthier and more delicious alternative to Pop Tarts or Toaster Strudel, especially if you make the pies rectangle shaped! You can take them right from your freezer and stick them in the toaster to warm up. 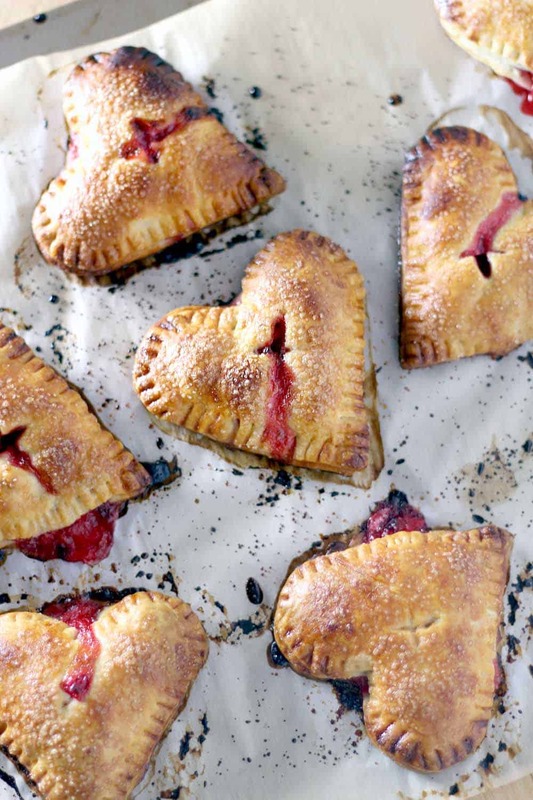 Not only are these mini hand pies adorable for Valentine's day, but they use very little refined sugar and are the perfect balance of tart and sweet! 1.5 cups chopped strawberries about 8 oz. Mix together the strawberries, sugar, cornstarch, and ginger. Set aside. Roll out the pie crusts and, using a 3" heart-shaped cookie cutter, cut 14-16 hearts. In the center of one cut-out, place about 2 tablespoons of the strawberry mixture. Brush the edges with the egg wash, then put another cut out on top. Use a fork to seal the edges, and pierce the top in a criss-cross with a sharp paring knife. Repeat for all the cutouts; place on a parchment covered baking sheet. Brush the tops of each pie with the egg wash, and sprinkle turbinado sugar on each. Bake at 425 degrees for 20 minutes, or until golden brown. These will stay fresh in an airtight container for 4-5 days at room temperature. Freeze any extras and microwave to reheat individually. I used this traditional pie crust recipe. Love these! So freaking cute. Must try! So pretty! I’m sure they taste great! Those little hearts look absolutely darling. Happy Valentine’s Day and no more snow storms.